Ethynodiol Diacetate and Ethinyl Estradiol. Lactose (anhydrous), magnesium stearate, microcrystalline cellulose, polacrilin potassium, and povidone. In addition, the coloring agents are D&C Red No. 30 Aluminum Lake and D&C Yellow No. 10 Aluminum Lake. Lactose (anhydrous), magnesium stearate and microcrystalline cellulose. 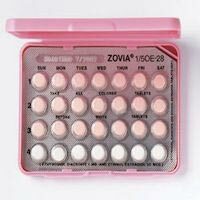 I have been taking this birth control for almost 5 months now. Around the 3 month mark my skin started breaking out. I am clear on the placebo pills but then start breaking out again once the hormone pills start again. Do I just need to wait it out longer? Or should I switch pills?